Z074 Hydra, T.S. & L.S. Z078 Hydra, with male gonad, T.S. Z079 Hydra, with ovary, T.S. Z080 Hydra with spermaries, W.M. 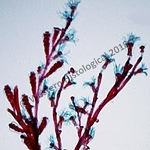 Z090 Obelia, polyp stage, W.M. Z092 Obelia, polyp stage, T.S..